A screencast is a video of what’s happening on a computer screen, accompanied by system sounds from the computer (like beeps). More sophisticated screencasts can include a recorded voice, highlighting, arrows, and other effects. 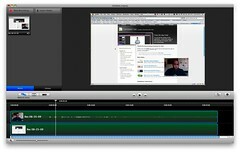 Instructors can use screencasts to ..
Apple’s Mac OS includes basic screen recording through QuickTime Player. Windows 10 offers it through the Game Bar. Software like Snagit can do the job inexpensively on either platform. Need more than just basic features? Try Camtasia. Notre Dame also offers Panopto with a Notre Dame login. Primarily designed for lecture capture, Panopto has screencast functionality and integrates nicely with Sakai.